This is the latest in our series of all time starting nines for some of college baseball’s most successful programs. Players’ professional careers were not considered, just their college careers — along with consideration given to their positional fits as well as a batting order that could provide a combination of a high batting average, speed and power. Fariss shared the left side of Oklahoma State’s infield in the late 1980s with Robin Ventura, the Oklahoma State legend and 16-year MLB veteran, and amazingly, Fariss actually had better numbers in 1988, when Ventura was named national player of the year. During his First Team All-American campaign as a junior, Fariss hit .397 with a team-high 30 home runs and an NCAA-best 114 RBI, while producing a ridiculous .860 slugging percentage that ranks as the third-best single-season percentage in program history. He was also a master at getting on base, as seen by his .571 on-base percentage as a junior. There are countless school, conference and NCAA records set by Incaviglia that could be used to describe the historic nature of his college career but perhaps the best way to introduce him to this list is the following: Baseball America named Incaviglia college baseball’s player of the century in 1999. Think about that for a moment. Of all of the thousands of players who played college baseball in the 1900s, the publication named Incaviglia the best of them all. He set five NCAA records, four of which were single-season marks set in 1985, when he hit 48 home runs, knocked in 143 runs, compiled 285 total bases and produced an absurd 1.140 slugging percentage. He hit .464 that season with 21 doubles, 80 walks and 98 runs. He was once intentionally walked five times in one game against Wichita State, which shows just how feared of a hitter he was in college. Incaviglia’s 48 single-season home runs are 18 more than the second-best single-season mark in Cowboys history and his 143 RBI are 29 more than the next-best total by an OSU player. His 100 career home runs are an NCAA record and he set seven Big Eight records, in addition to being named a three-time All-American and two-time College World Series All-Tournament Team honoree. We could go on forever about Incaviglia’s accomplishments, but we’ll end on this – in his worst college season, he hit .371 with 23 home runs and 78 RBI. Barragan rounds out Oklahoma State’s all-time starting infield to give the 1980s Cowboys a trio of players who were teammates in Stillwater. Like Fariss and Ventura, the two-time All-American and Oklahoma State Hall of Fame first baseman is among the best power hitters in school history. Barragan ranks fourth in career hits (279), sixth in home runs (54), RBI (231), and total bases (489), ninth in runs (216) and 10th in career average (.377). Defensively, he was strong at first, recording a fielding percentage of at least .988 every season, including a career-best .995 percentage as a sophomore. Barragan’s .420 batting average as a sophomore ranks 13th in program history, his 105 hits that season are the fifth-most ever by a Cowboys player, his 24 home runs are the eighth-most in a single season, his 91 runs batted in ranks 12th, and he once got a hit in eight consecutive at-bats. As a junior, Barragan was named to the College World Series All-Tournament Team, capping off another impressive season in which he batted .371 with 21 home runs and 85 RBI. We’re exercising some creative freedom with this choice. Mach, who started his career at Washington and spent a season at Edmonds Community College, played for Oklahoma State for two seasons – the first of which he played third base. Mach played second base in 2007 and Robin Ventura, you know, the two-time Sporting News Player of the Year and three-time First Team All-American, is a no-brainer for OSU’s all-time starting third baseman position. Not only did he lead the Cowboys in both home runs and RBI in 1990 (23 home runs, 92 RBI) and 1991 (27 home runs, 107 RBI), but Daniel led the NCAA in runs batted in during both seasons and homers in ’91. However, Daniel wasn’t just a one-trick pony. He was able to hit for average – .362 in 1990, .350 in 1991 – and he had an on-base percentage in the .480s both seasons, showing his patience at the plate. He had two 100-plus hit seasons, including a 101-hit, 100-run season as a sophomore, when he led the NCAA in runs scored in 1996. You can find McNamara’s name in OSU’s record book among the top-10 single-season record-holders for hits, doubles, home runs, runs, and total bases. This was a no-brainer. Ward is Oklahoma State’s winningest baseball coach in terms of both win total and winning percentage. He owns a career record of 953-313-1 (.752) with the Cowboys, which is more than 600 more wins than any other coach in program history. Under Ward, OSU won the Big Eight every year in his final 16 seasons with the school and in 17 of the 19 seasons he was at the helm of the program. 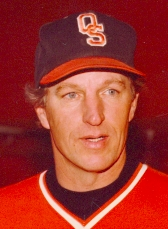 Ward is responsible for 10 of Oklahoma State’s 20 College World Series appearances, including seven consecutive appearances in the 1980s. The Cowboys were the national runners-up in 1981, 1987 and 1990. He was a four-time Big Eight Coach of the Year, an award that no other coach won more than once, and he led the team to 17 NCAA regional appearances.